Occasionally it is impossible to discharge waste water to a convenient drain under normal gravity conditions. When this is the case you may find the only solution is to utilise a shower waste water pump. Depending on local site conditions and the type of shower tray and enclosure you are using solutions vary. For example, if you can create an initial gravity fall in 40mm pipework from the waste trap you may be able to use a simple shower waste pump such as the Grundfos Sololift 2 D-2 or the Saniflo Sanishower . 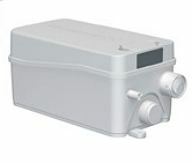 These relatively inexpensive solutions rely on a gravity flow to a box-like chamber activating an integral pump which in turn expels the waste water, pumping away to a convenient drain which may be situated some height above the shower tray. There are however occasions when handling the waste requires a more elaborate solution. If, for example, you need to use a low profile shower tray on a solid floor into which you may not rebate pipework you may need to use a solution such as a Digital Pump. 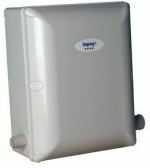 Invariably, these utilise small bore pipework and a slimline shallow trap (requiring minimal excavation beneath the tray) and scavenge for any water that falls in the showering area. Some such devices sense flow, others activate simultaneously as you switch on the shower equipment.